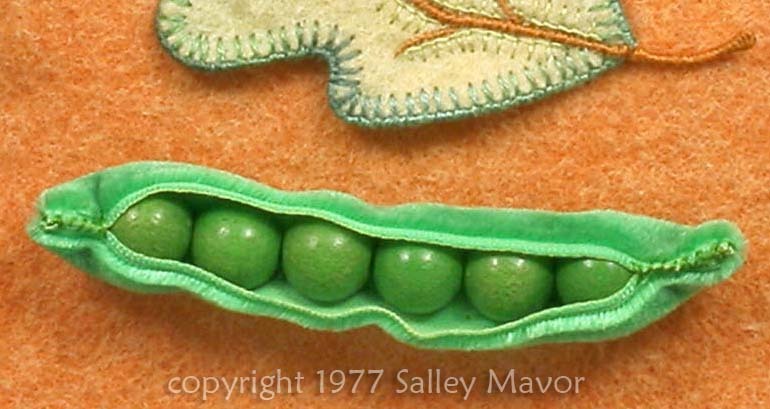 The peapods were the gateway to my life of stitching. I started making peapods and other pins in art school, as a totally separate project from my class assignments. Some of my friends knew about them, but my teachers hadn’t any idea. With that simple encouragement, I stopped trying so hard to communicate the pictures in my head through a brush or pen. Given permission to work outside of the usual illustration mediums, I found that I was much happier and energized. I was no longer struggling to keep in step, but, with a needle and thread, I could dance. For some reason, I’d been under the impression that in art school, one does “serious” fine art and I’d kept my interest in sewing and handcrafts underground. I rediscovered the joy of creating and learned to trust my hands and gut feelings to help work out challenges. After graduation, I added more designs and started mass producing pins and selling them on a wholesale basis to shops. I had to really push myself to call shops and arrange business calls with my basket of pins in hand. I was more content sitting at home, covering little red beads with sheer lavender fabric to make bunches of grapes or sewing strings of green wooden beads inside a velvet ribbon peapod. Despite my shyness about pedaling my wares, I found the marketing part of the business to be a creative excercise. I’d spent my teenaged years working in my mother’s import shop in Woods Hole, From Far Corners, and the experience dealing with customers and learning the difference between wholesale and retail sales was helpful. I started making custom pins of people’s cats, based on photographs they sent. I remember that Siamese cat owners were particularly fussy about their breed and one time had to redo a blue point. The cat ears are made from a coiled wire bead, which is cut in half. Some of the pins like the cat and the watermelon have a cardboard shape inside to give them stability. I’d sew a little pocket, turn it right side out and slip the cardboard in, put in some stuffing and sew up the pocket. 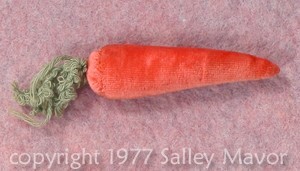 I used my Singer Featherweight, the same machine on which I learned to sew, to do the machine part. There was always a lot of hand sewing to finish and attach the pin back. I had some labels printed with my name and sewed them under the pinback. They were the same kind of labels you get at fabric stores for sewing on your children’s camp clothes. This is the first of 3 parts. The story will be continued in PINS (part 2). This entry was posted in Animals, Fabric Relief, Found Objects, my design productions, Pins, RISD student work, Studio by Salley Mavor. Bookmark the permalink. I LOVE the “blue point” fabric! I wish you a speedy, healthy recovery, Salley. These pins are delightful. I especially like the kitty! Oh, I can’t wait to see where this story is going! I feel like I am similar to you way back then. I am also stitching pea pods as a beginning and am trying to figure out where to go with this next. Thank you for sharing your story. Wow! The story of how liberating it was to be able to express your art in a compatible-with-you medium is so great! I feel like I’m on the cusp of that experience but don’t yet know which medium is me. (I have some health issues to clear up before embarking on my art journey in earnest.) Your pins, every one of them, are beautiful. It warmed the cockles of my heart to see the patterns. I have a small collection of similar looking ones for everything from Valentine hearts to felt animals. Those “orginal” patterns quicken my pulse. They are the foundation for all sorts of creative possibilities. Wonderful part one – the blossoming of you as an artist finding your way. Thanks for sharing. Fascinating, especially how a few words from a perceptive teacher can make all the difference! It kills me that I have lost all the little kitty pins I’d bought from you, way back in the early “80’s. I know I had at least 3. 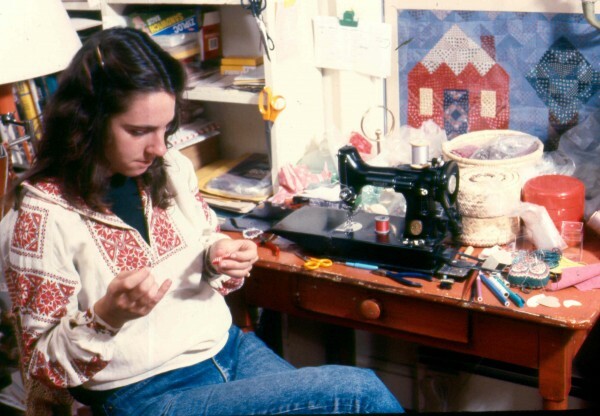 Also, it amazes me that you have so many photos of yourself working and of your work space from those early days. I wish I had more photos from the early days. There are huge gaps and the only reason I have anything is because my husband has taken pictures periodically, usually because I had to send in a photo for an article or something. I just found your blog. I was posting a little purse that my daughter and I made from your book Felt Wee Folks. I LOVE that book. It is the kids craft book that I used to make them things and to have them help make things and they turned out like the photos!! If you want to see what I made, just go to my blog above. Sorry about your wrist. I got kicked by my horse a couple of years ago. He broke my arm in two places. I spent 9 weeks in a cast that went from my hand over my elbow. It was really tough trying to cook for my kids and do things, especially since he broke my right arm and I am right handed. About week 8 my shoulder froze, ask your doctor about that. I spent 12 weeks in rehab fixing my shoulder, but now my arm is pretty much as good as new. I am back to riding my horse and doing everything else. I have to say that time spent in a cast changed my life and focus. I started doing art more seriously, and I am now in a serious fiber arts group and finishing my first piece to go into a show. You never know how things will change your life and lead you into a new direction. Good luck… I just love looking at your work. Loved seeing the picture of you as a “girl”……working on your projects. So glad that your art mentors in school let you go the direction you naturally chose. Good teachers!!! Sorry to hear you injured yourself, although I’m not clear what your injury is. Hope it heals well and soon. Oh, how I wish I had been able to purchase some of your wonderful pins way back when. Pins, brooches, etc. have always been my favorite jewelry. Best of luck with your injury. I still have my watermelon pin. 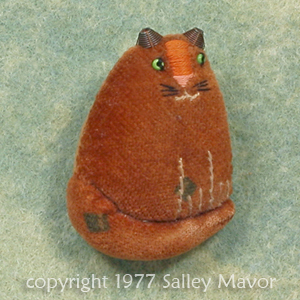 I really like the cat pins, how fun to look back at something you did 30 years ago! I made some woolwork pins awhile back, looking at your pins makes me feel like starting up again. Oh my, are they available anymore? I love them! Sorry, Kathy, I haven’t made them for over 25 years.